A return to the age of Enlightenment? We are delighted to announce the support of our friends at SCEL, Scotland’s College for Educational Leadership, and also our sister organisation BELMAS in hosting this event. which addresses the theme of equity and education. Once the venue for the famous “Oyster Club” of the Enlightenment, frequented by Adam Smith and other such luminaries, this UNESCO protected world heritage site is the ideal location for an honest and open debate around aspects of the challenge of (in)equity in education. 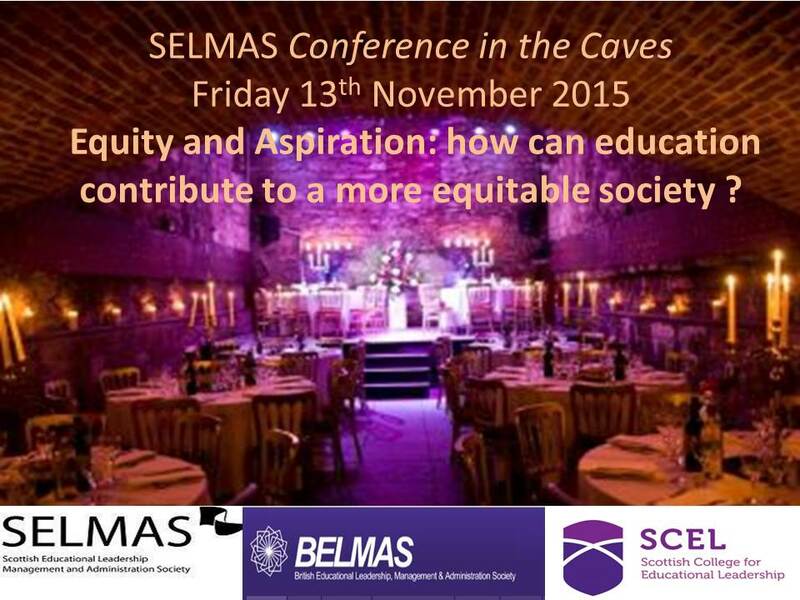 SELMAS Annual Conference 2015: Equity and Aspiration – How can education contribute to the creation of a more equitable society? Welcome back to session 2015-16. Everyone at SELMAS wishes all our followers; leaders, educators and students alike every success and best wish for the new term. To kick things off we have organised our fourth Brainstrust event – this time in the new Malala Library in the recently rebuilt James Gillespie’s High School. We are grateful to Mr Donald MacDonald of the school for letting us use the premises and also to the Centre for Confidence and Well-being for their partnership in this event. Brainstrust is a SELMAS speciality – it is a SELMAS type of discussion event we like to host on a very topical issue; sometimes in response to a document or report which is relevant to educational leadership, or sometimes on a question or problem which has been ruminating within the system and surfaces at a certain time. Being an independent body of volunteers we can organise these events quickly, so they have a bit of a “pop-up” feel. Keep on the look-out for them as you don’t often get much warning! To do this we rely on friends and supporters, so we always have a partner organisation with us in brainstrust. We call these events “Brainstrust” because they involve serious thinking about serious issues and true to our principles, SELMAS does not defend any particular agenda in the course of the discussion but allows all manner of questions to be asked – difficult and awkward ones included, in order to allow a space for mature, open, informed and sometimes critical conversations about educational matters to take place. If you are on our mailing list a flyer will be arriving in your inbox very soon. But as a special reward for reading our blog you can preview it here: Flyer for Brains trust 9.09.2015 and get your booking in early via eventbrite. Looking forward to seeing you there!